Bellevue Park reflects the genius of two of America's pioneering advocates of urban beautification and landscape conservation. Harrisburg businessman and civic leader, J. Horace McFarland (1859-1948), a principal Bellevue Park investor, was a national spokesman for urban beautification and natural landscape conservation; while the designer, Warren H. Manning (1860-1938) of Boston, was one of America's pre-eminent landscape designers in the early twentieth century. The collaboration resulted in central Pennsylvania's first landscaped suburb. 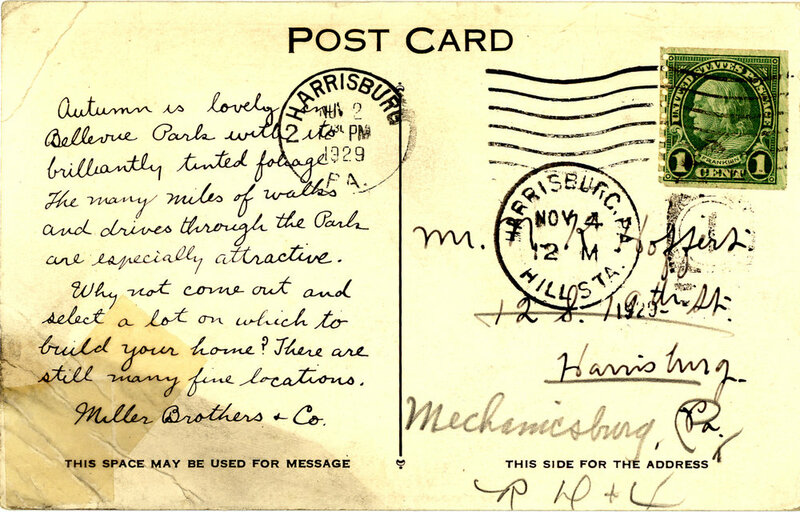 In 1907, McFarland and Herman P. Miller, also of Harrisburg, formed the Union Real Estate Investment Company and began to assemble a 132 acre tract of agricultural land just east of Harrisburg's city limits. The company hired Warren Manning to design a landscaped suburb. This tract became Bellevue Park. Manning's plan, completed by 1909, included a network of roads which followed the natural contours of the 132 acre tract. He laid out lots for 280 "detached" houses in a tree-shaded, park-like setting, free of fences, telephone poles, overhead utility lines and black smoke (see Covenants). This landscaped neighborhood was the antithesis of typical urban residential development of the period - row houses lining streets laid out in a grid. To insure the perpetuation of these aesthetic amenities, the Company incorporated restrictions into the deed of each of the 280 lots to be sold. This new, bucolic life was within easy reach of downtown Harrisburg, the center of the region's commerce and industry. By 1910, the grading of the roads, laying of the sidewalks and underground utilities, planting street trees, defining the reservations (parks), and creating the ponds, was sufficiently complete to begin selling lots. The Union Real Estate Investment Company opened its sales office, designed by architect Miller Kast on 21st Street, not far from the eastern terminus of the trolley line in 1910. The sales office was subsequently relocated to its present site on Oakwood Reservation where it serves as the Community Building for Bellevue Park's Neighborhood Association. The real estate company's sole ownership of the 132 acres secured the common landscape quality that Manning's plan established. In addition, the real estate company approved the designs of all proposed houses. Subsequently, this architectural review process became the responsibility of the Bellevue Park Association. The design oversight has had an important result on the architectural quality of the neighborhood's houses. Many of the houses in the Park were designed by different locally significant architects and present a rich variety of architectural styles from Colonial Revival and Tudor Revival, to Moderne. The houses in the Park have been either individually commissioned or built by contractor-developers on speculation. In the earliest years (1910-1920s), most houses were commissioned by someone who had purchased a lot. During the 1920s, a single developer built a number of smaller houses on both Market and Chestnut Streets on speculation. Generally, construction activity declined in the Park during the early years of the Great Depression (the 1930s). In the six years (1936-1942) prior to World War II, however, a number of houses were built, again either by individual commission or on speculation. Several houses along Edgewood and Bellevue Roads date from this period. Development of the neighborhood since World War II has been minimal because fewer lots have been available and the trend to live outside of cities. The more recently built houses are found throughout the Park, being built on the scattered available lots. The real treasure of Bellevue Park is the contoured terrain, the winding streets, and the established landscaping. These qualities cannot be separated. From the neighborhood's inception, it was to be a residential community of detached houses located in a landscaped park. Deed restrictions limited the use of fences and controlled the removal of trees on individual properties. All utilities were placed underground. Manning's design established the common landscaping: American Elms were planted along Bellevue Road, Market Street, Valley Road, and 21st Street; ginkgoes followed the "emerald ribbon" along Pentwater Road; different varieties of oaks as well as Chinese elms were planted along several other streets; while magnolia trees were more recently planted in the median of Magnolia Drive. Manning took full advantage of the 132-acre tract's topography. He laid out the reservations along the natural valley between Briarcliff and Pentwater Road, and dammed the stream at three points to create ponds. The five reservations - Manning, Willow, Spruce, Oakwood, and McFarland (formerly Briarcliff), - are owned and maintained by the Bellevue Park Association. Although the reservations and ponds are for common enjoyment, they are not public/city property. In addition to the reservations which were designed for passive recreation, Manning planned for active recreation as well by designing, for example, tennis and shuffle board courts in some of the reservations. As a real estate venture, Bellevue Park was not a resounding success for its original investors. The Union Real Estate Investment Company went bankrupt in the 1930s. But Bellevue Park's true success is best evidenced by how well its original plan has been maintained and how successfully the landscaping has matured. The "emerald ribbon" bisecting the Park (northeast to southwest) provides a lush, natural environment in the midst of Harrisburg's dense development. A jewel of early suburban design, Bellevue Park has only improved during the almost 90 years its landscaping has matured. 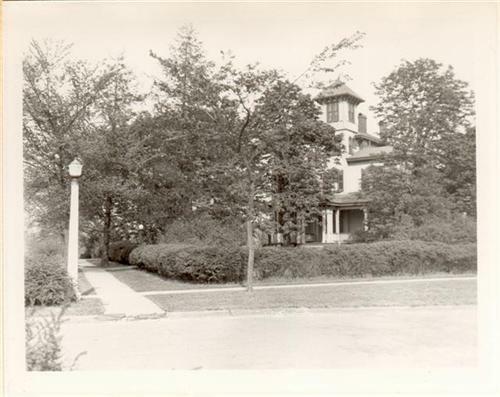 A virtual tour of historical Bellevue Park properties was created by HACC student Robin Goudy.